There are a lot of good reasons to have a hot tub. For starters, it is an excellent way to relieve stress and anxiety. It also helps those with chronic pain and it is a great way to spend time with friends and family. Having a spa or hot tub is ultimately a cost-effective way to accomplish all of that without having to endure the continual expense of having to go to a gym, resort to anti-depressants and more. That is of course if you have a quality spa or hot tub otherwise you are just increasing your stress and anxiety. So what are the health benefits of a hot tub? 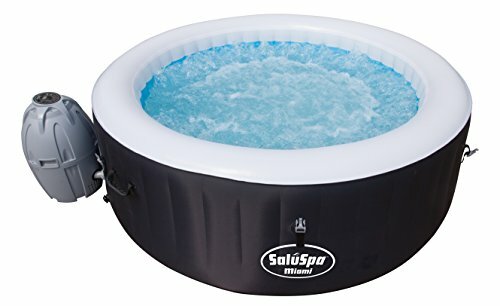 So let’s dive in to find the Best hot tubs having the reputation of reliability. Check the following table for a quick comparison between different hot tubs available in the market. Tubs are organized with most popular at the top. Most popular and trust-able brand in hot tubs! If you’ve never shopped for inflatable pools or the like, then you’ve probably never heard of the company Intex. 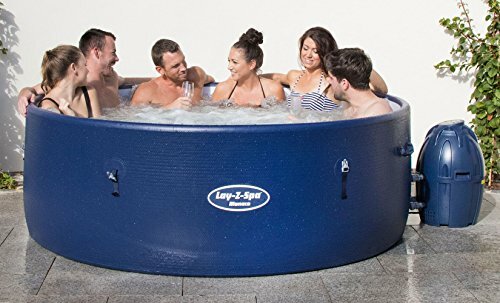 They specialize in products like portable hot tubs and their products reflect their high reputation in the industry. 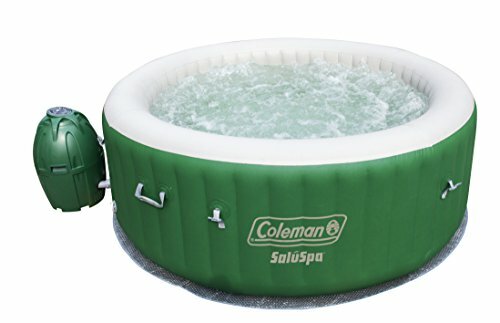 Unlike the Coleman Tub [2nd popular], this model comes with an entire set of accessories that are necessary for any tub. This includes extra filter cartridges, chemical testing strips, and a chlorine dispenser. Specialized built-in hard water treatment system.! Without getting too deep into the specifics, it is intended to soften water for less irritation on the skin. It also extends the life of the spa by reducing the buildup of minerals in the pipes and tubes. Temperature control comes as easy as the press of a button through an easy-to-use digital control panel. The signature feature of any bubble spa is the bubbles, and this model has a lot of them. With 120 high powered jets, bubbles fill the surrounding water immediately and leaves you with a very subtle, relaxing massage. Improved heating and safety through insulated cover. 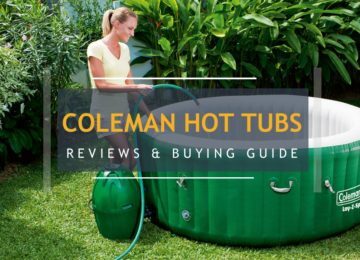 With over 1100 customer reviews on Amazon and at a price of under $500, Coleman is a huge hit in the world of portable hot tubs. Although they are normally known for their outdoor camping gear, Coleman has branched out successfully by creating a fascinating product. 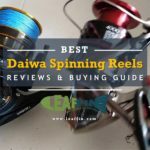 Even at such a low price point, the SaluSpa is packed tight with features that you can enjoy with 4-6 of your best friends. Fast, easy setup – inflates using the spa’s pump – NO tools needed: It comes with built-in heating that takes around 24 hours to get from cold hose water to steaming hot. Simply plug it in, set the desired temperature on the digital control panel, and enjoy. It is capable of maintaining temperatures constantly through several days or weeks, but we recommend you to lower the temperature when not in use to save power and money. Air bubble jets come as a standard feature. They are great for relaxation and will almost perfectly emulate the feeling you get at a real spa. The bubbles are pumped in using surrounding air and float up from a ring of holes in the floor. Unfortunately, if your surrounding environment is cooler than the tub, using the air bubbles will actually cool down the hot water. This wouldn’t be a problem if the hot tub could simultaneously heat water and pump air, but it cannot. The hot tub also comes with a built-in water filtration system, but you should still use chemical products like chlorine to keep the water clean. Make sure to do your research or you may face some unfortunate chemical burns or worse. 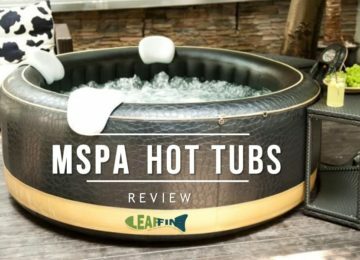 Through its Superior Strength & Durability: It allows users to sit on the sides without the spa bending or buckling, making this product superior to others in its class. 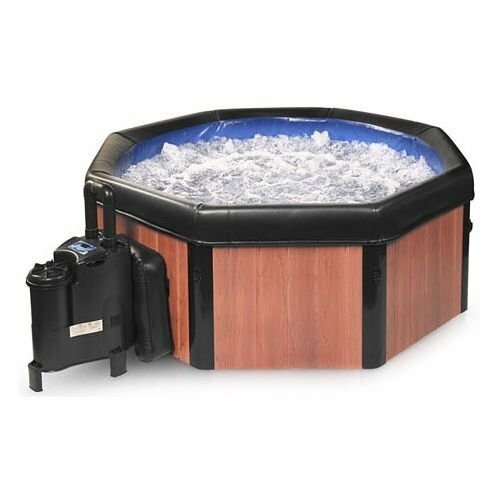 This portable, inflatable hot tub with cushioned air mat floor and quick drain system have soothing bubble jets and an integrated water filtration system. It is also equipped with a rapid heating system that can heat up to 104 Degree F (40 Degree C). This item has an LED light show that cycle through seven colors. 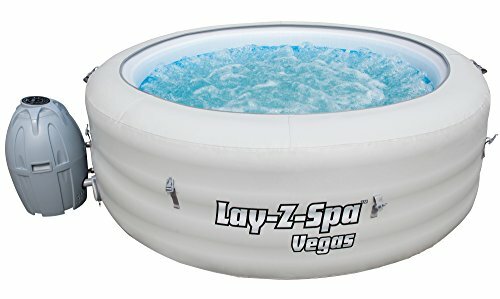 Lay-Z-Spa is designed for 4 to 6 people. This item is easy to set up. It does not need any tools. 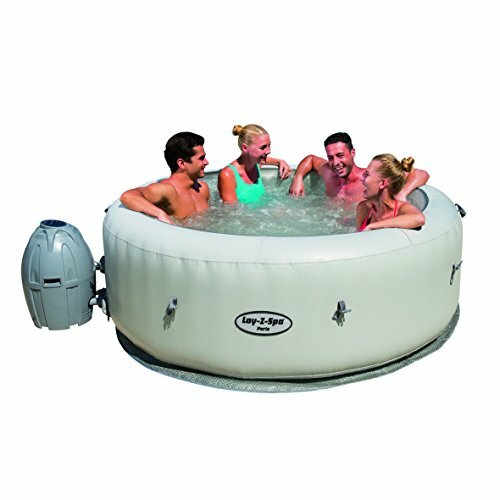 This is another great inflatable hot tub that will work great for families with 4 to 6 members. 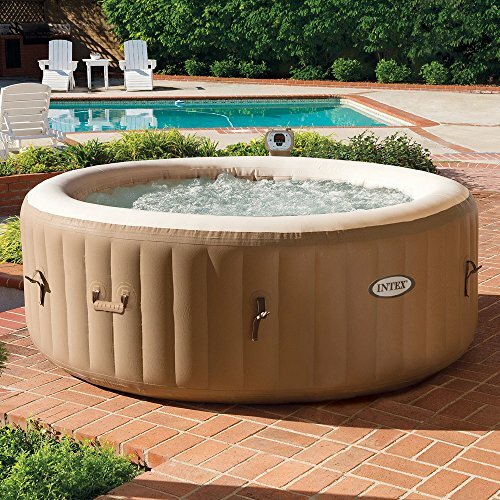 This portable hot tub is equipped with its own fully functional hot tub system and Lay-Z Massage Jet System. It is also easy to set up. In fact, most users are able to set this up and fill this with water in only 10 minutes. In addition, it comes with a free setup DVD and maintenance guide. You do not need any professional to get this working. Size: 4 Person | Water Capacity: 192 Gal. 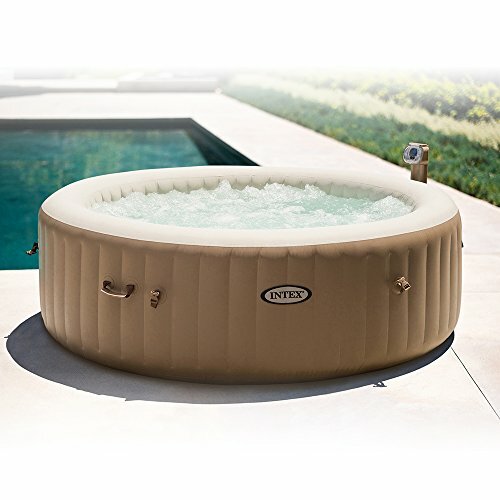 Coming in at a few hundred dollars more than most inflatables, the Spa-N-A-Box by Comfort Lines is a great hot tub for those looking to buy an incredibly transportable spa. Easy to setup, installs in less than 20 minutes with no tools needed! Plugs into any standard 110V Grounded Outlet. This tub’s walls are actually composed of 8 individual, faux-wood panels. These panels are intuitive to set up with the provided frames and come with the advantage of being portable. Simply tear down the hot tub for easy storage or transportation. Everything about the tub can be dismantled besides the water heater, and that makes it great for transporting to remote locations away from home. 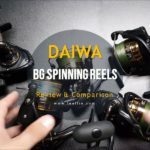 Just check out their assembly video if you want to see how easy it is to assemble and dismantle. Manufactured by Bestway, the Paris AirJet comes with a nice cushioned air mat at the bottom of the tub. It feels soft and cushioning on the feet. This will protect the tub from hard objects on the floor puncturing the tubs bottom lining. 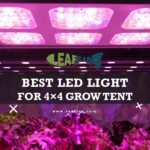 The distinguishing feature that makes this model unique is the LED lights located inside the tub. While it may not be great during the daytime, it lights up nights and makes for a much more engaging hot tub experience. It can be set to rotate through colors automatically or sit on a single desired color using the control panel. 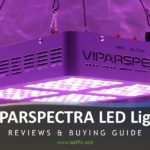 The light show feature is great for impressing friends and simulating a real, premium hot tub without breaking the bank, but we believe that it is not worth the additional costs. 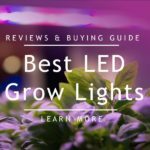 Instead, if you wish to have lights in your inflatable hot tub, you should look into purchasing waterproof, battery-powered lights like this one. Best price for maximum person capacity. 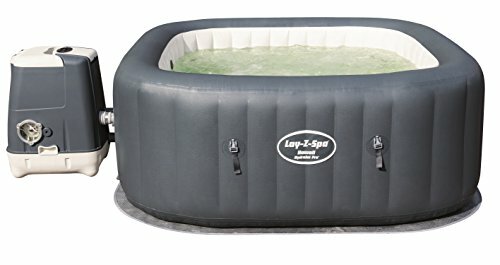 6-8 people can enjoy in this under $600 tub. 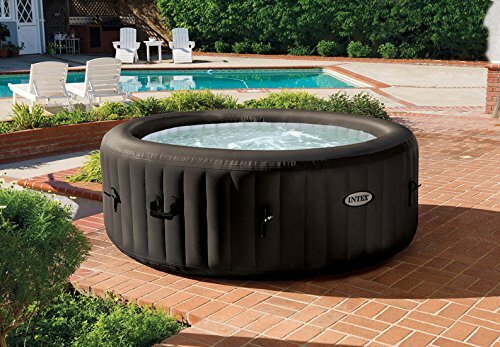 This inflatable hot tub is portable and inflatable. It can accommodate 8 persons with still enough room to spare. This product is compact with a rigid It has inflatable construction and a narrower wall that allows for a water capacity of up to 1540 liters. 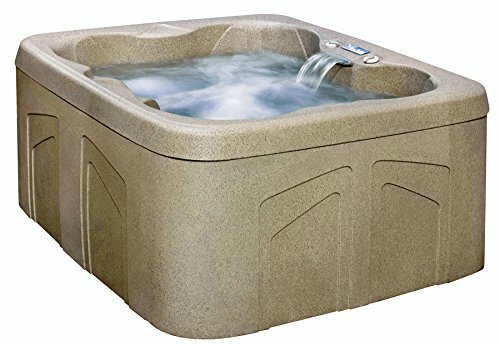 The Lifesmart Rock Solid Simplicity Series Hot Tub has a sandstone look that makes this unit both functional and attractive. It has a Balboa digital control interface that can be reached while in the tub and the filter system is easy to clean and replace as necessary. It’s plug and play, so there is no extra wiring involved and it has twelve therapy jets to help reduce your stress while massaging your muscles. It has a waterfall and a 12V LED light for effect. The pump is a high efficiency 1.5 horsepower pump that won’t raise your energy bill too much. People who have this model love just how efficient this model is and how comfortable it is to use. Another model manufactured by Intex, it provide extra value of Jet massage. Well, outside of its slightly cooler, black paint job, this model comes with four high powered jets that bring several advantages over bubbles. First off, jets massage the muscles a lot better than bubbles do. They actually relax the muscle deeply rather than just barely working the surface. This means that the Jet Massage set is much better at its job of providing pleasure compared to its bubbly counterpart. 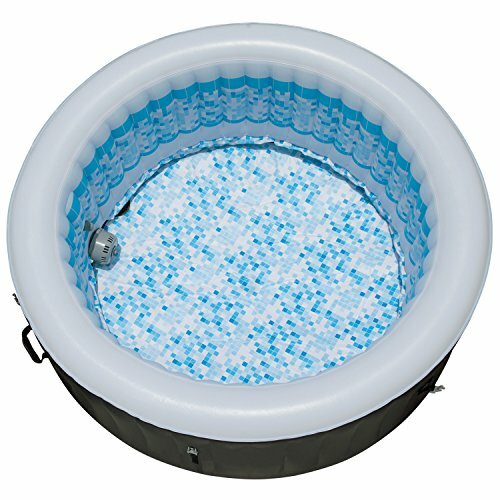 Size: 4-6 Person | Inflated Size: 71″ x 28″ | Water Capacity: 177 gal. Reported by customers, Saltwater system doesnt work. pH in hot tub must be constantly maintained between 7.2-7.8 for several reasons. Failure to maintain the proper pH can result in chemical ineffectiveness, skin irritation, corrosion inside the hot tub, and more. pH of your water is impacted by many different things including the source of your tap water and the chemicals that you add. You must check the pH everytime you add chemicals/water through Testing strips or a digital meter:. The testing strips not only measure pH levels but also chlorine, bromine, and alkalinity levels which is extremely helpful. We recommend the strips over the digital meter unless you want to buy separate chlorine, bromine, and alkalinity testers. use pH balancers [Spa Up and Spa Down ]to reach the optimal range. Use sanitizers to disinfect the pool and keep it sparkling clear. Since hot tubs run at high temperatures, microorganisms can quickly breed and make the water smell or even unsafe. You have to maintain total alkalinity and calcium hardness as well, Check this post to know about the parameters to check and the chemicals you need for your hot tub. Use tablets of chlorine and bromine to quickly and safely clean water. So tell us in comments What hot tub you chose? and what do you recommend?